Maintaining bookmarks (favorite links) is an important aspect of web browser usage. We bookmark specific webpages or websites as favorite for quicker access in future browsing sessions. Over a period of time, we tend to build big list of bookmarks of various websites of interest. With weblinks bookmarked in web browser, we do not care to remember actual weblink URLs (why should we?). However, if specific bookmark or favorite link is deleted accidentally – there is very slim of chance of remembering it manually. Popular web browser keep history of bookmarks list changes which can be used to recover deleted bookmarks. 1. Goto Start > Run and press Win + E to Windows explorer. In the run box or in the address bar of Windows Explorer, navigate to following folder location for Google Chrome bookmarks backup. Make sure you replace MYNAME with your actual Windows user name to open the correct folder containing files for Google Chrome browser installed on the computer. 2. Folder should contain two bookmark files: bookmarks and bookmarks.bak respectively. 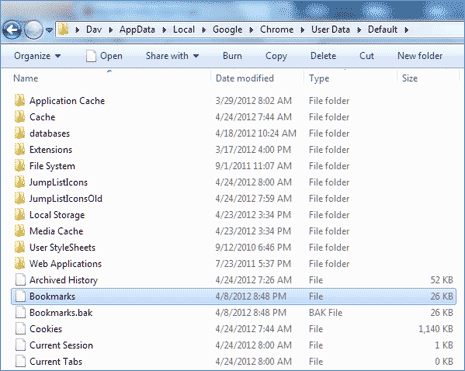 Bookmarks file contain recent changes to bookmarks list, while bookmarks.bak contain older bookmarks content. Rename bookmarks to bookmarksold.bak and bookmarks.bak to just bookmarks (removing .bak extension). 3. Close and reopen Google Chrome browser. Deleted bookmarks (favorites) should be visible now as they are restored automatically with above renaming of bookmarks file. You may delete bookmarksold.bak files now. 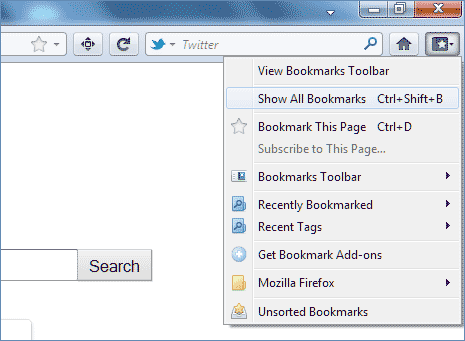 Unlike Google Chrome, no manual bookmarks file renaming is required in Firefox browser. Bookmarks manager in Firefox browser is quite advanced with in-built feature to restore and recover bookmark links from the backup file. 1. Open Firefox browser, click on Bookmarks button and then click on ‘Show all Bookmarks’ option (or just press Ctrl + Shift + B keys). This will open Library listing of bookmarks contained in Firefox browser. 2. Click on Import and Backup button and then point to Restore option. Click to select specific date from the listing to restore bookmarks collection as it was at that date. After that, re-open Firefox browser and you see should missing bookmarks (favorite links) restored in Firefox automatically.